Last week I had some annual leave to use up before the end of the financial year. As I wanted to use it to go somewhere and not waste it at home watching Homes under the Hammer, my girlfriend and I book flights and an apartment in Valencia, Spain for 3 nights. We had a great time, the weather was fantastic and the food was hit and miss. What I want to talk about though is the Jardines del Turia. 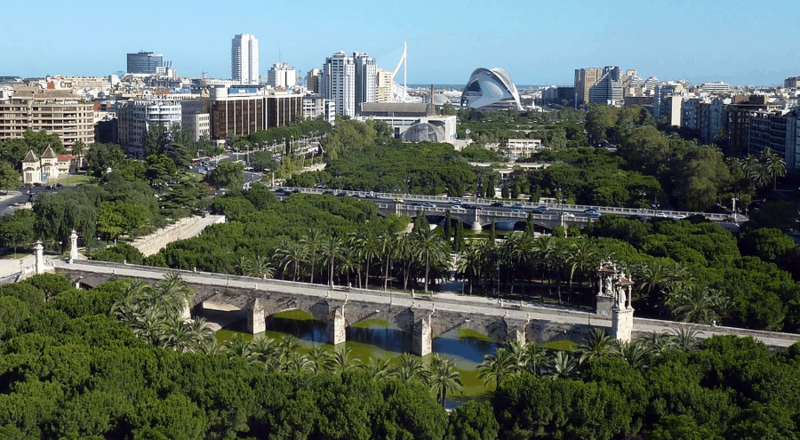 The Jardines del Turia are vast gardens are built on the former riverbed of the River Turia. After a devastating flood on 14 October 1957, the Turia’s course was diverted south of the city. The old course of the river was converted into a city park crossing the city and bordering the historical city centre. I hadn’t done any research before my trip, but I always take my trainers and kit with me if I go away. It’s a great way of seeing a city or area and its always nice to get up and go for a run. I had wandered in the park on the day we arrived and it looked a nice place to run. 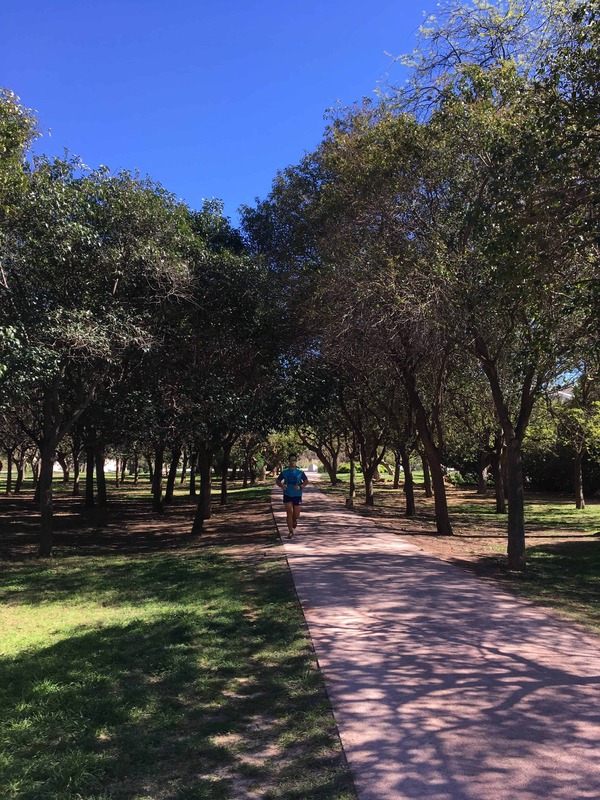 I headed out on Saturday morning and jogged the 5 minutes to the park. The sun was out, there was a nice breeze off the coast and I saw a few other runners. It looked promising. Within a few minutes, it became very obvious that it was a fairly popular place to run. There were plenty of people in front of me, behind me and passing me going the other way. In the UK, whilst running on Wimbledon Common I may come across 10 or so runners at best. On Clapham Common, you will come across a lot more but it is not an area specifically set up for running. In Valencia, I passed hundreds. I looked across to the other side of the park and there seemed to be more runners over there. I was already thinking of turning for home so I looped across the park and heading back the other way. The first thing I saw was a signpost suggesting this was a dedicated runner’s path. 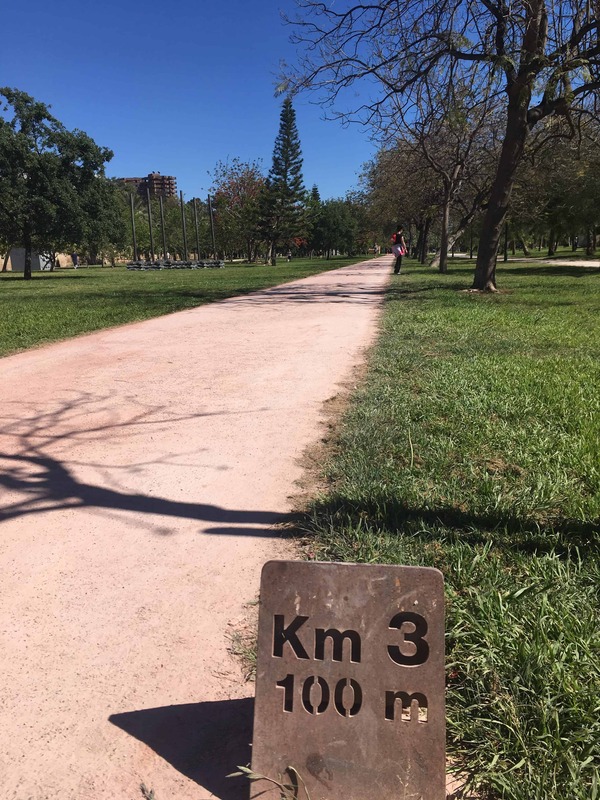 I then looked down and saw the kilometre and metre markers. What a great idea! The path is actually called the Turia Gardens 5K Circuit and it has its own web page, provides information boards for tourists (so you can learn as you run, or just take a lot of breathers), special lighting, special surface, cross training areas and is well shaded so you can avoid the sun. I finished my run passing the striking Palace of Arts (Opera House), Science museum and Aquarium. I enjoyed it so much; the following morning I gave the beach a miss and headed back to the park. 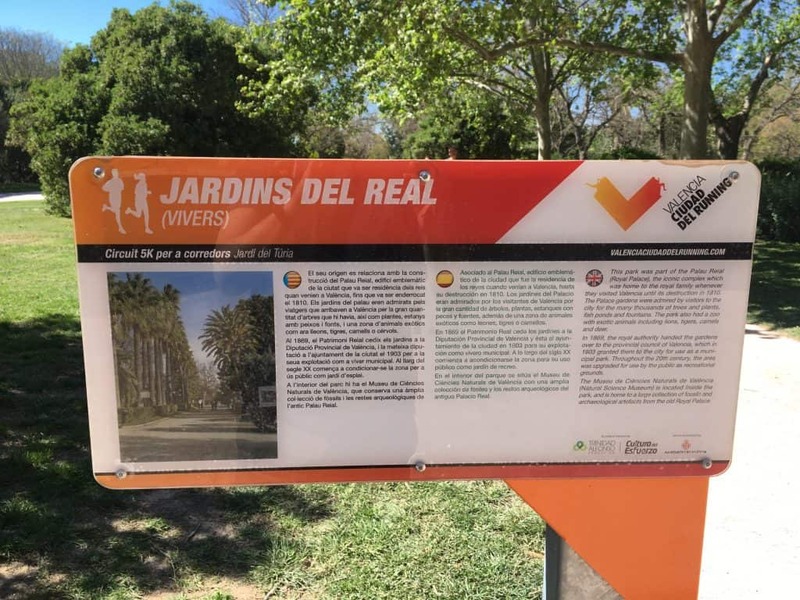 What I liked about the Jardines del Turia is that the city seems to take the health of its citizens seriously and provides quality facilities for them to use (there are also a number of football pitches in the park). The location of the park is a massive advantage, being so accessible for a good number of the population from so many areas of the city. Central Park in New York is much further away that you think if you are staying in Midtown. Since I’ve got home and looked up further information about Valencia. 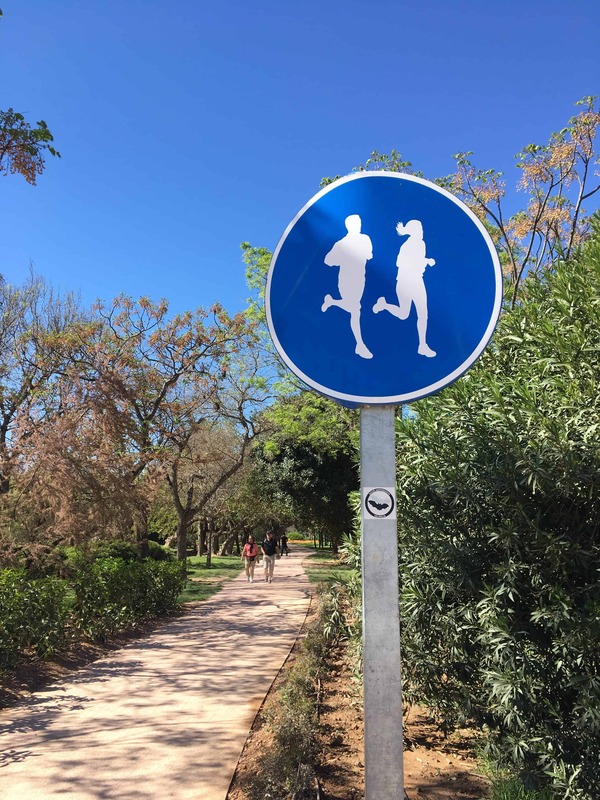 There is a city running website Valencia Ciudad del Running (in English) (translated as The City of Running) with information about running in Valencia, running news, the city marathon and half marathon as well as training tips. It’s a fairly small thing to do, to collate the entire city running information in one place to create a useful resource. The city takes its running seriously and judging by the number of people out in the park it’s working. There’s a temptation the just look at the marathon majors or other big city marathons such as Paris. But there are other city marathons that are potentially cheaper and easier to enter. I’m still on the fence about whether I will do another marathon, but I was inspired by Valencia. 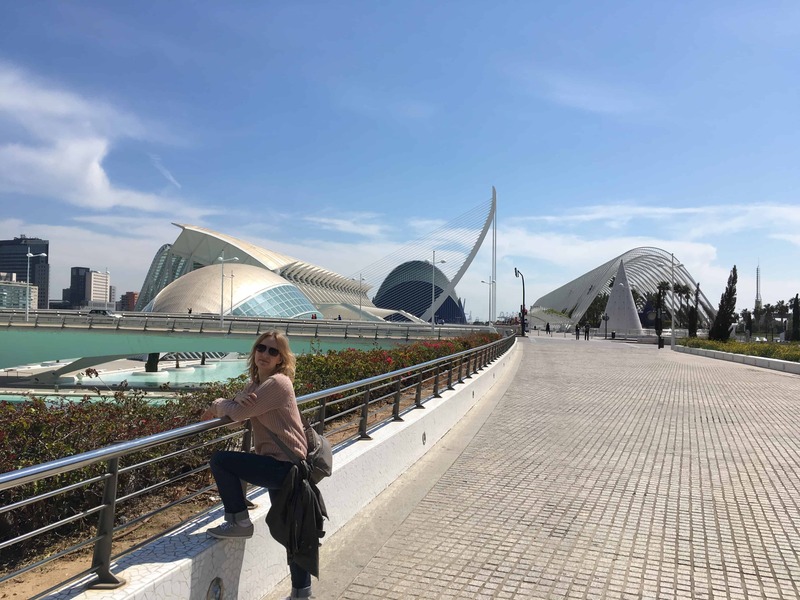 Since I wrote this post its seems the Valencia marathon has become pretty popular with runners in the UK and there’s been some very good feedback about the organisation and the unique start and finish line on a boardwalk over water at the City of Arts and Sciences. Here’s another 9 reasons to give it a go. 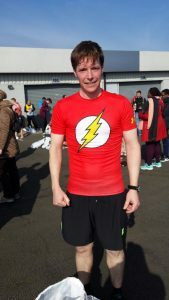 Note – There were more runners that the pictures show. Most of the photos were taken at siesta time whilst lying under a tree! Welcome. Just wanted to share with you the best of Europes festivals over the past year. I have visited most of these in the past and I can assure you that they are great fun. Find time to enjoy life and attend some of these this year. Looking forward to some more interesting posts on the Marina de Bolnuevo blog (www.marinedebolnuevo.co.uk). Have a great day. Next Next post: Hard work or talent? Which one?